The Beth Johnson Foundation, a leading intergenerational charity received funding through the Heritage Lottery Fund to work in partnership with Enfield Town FC and other local agencies including Enfield Age UK to capture and record stories and memories people have of the clubs and football in Enfield. Enfield Football Tales takes you on a trip through over 100 years of local footballing history. Starting in the Victorian days, a film history transports you from Enfield F.C.’s humble origins, through two World Wars and numerous financial crises to the 1960’s where the club reached the summit of Amateur Football in England. Relive the six Wembley Cup Finals, the classic encounters in the F.A.Cup and recall the names of the great players who wore the Enfield badge with pride. The story is brought right up to date with details of the formation and progress of the two current Enfield team, Enfield Town and Enfield 1893. The background to the Enfield Football Tales and the benefits of oral history are demonstrated in a compilation of clips showing footage from the 1960’s together with the recollections of those who played in the matches, rounded off with highlights from an open top bus tour around the Borough in 1967 showing how familiar local landmarks have changed over the last 40-50 years. Together with a mobile exhibition, tailored to fit the space available, plus a question and answer session, the talk aims to be both entertaining and informative. Sunday 25th November 2012 saw the project launched at the Queen Elizabeth Stadium, in Donkey Lane where a short performance about the clubs history was presented by Kingsmead drama students involved in the project. It was also an opportunity for people to bring in memorabilia about the club, some of which has been donated, or copied for use in the project that you may wish to donate or let us copy. If you would like to be involved, either to tell us your stories about memories of football in Enfield or talk to us about how you might like to be involved, as interviewers, researchers, creating resources that will ensure the football heritage of Enfield is passed on and enjoyed by generations to come. 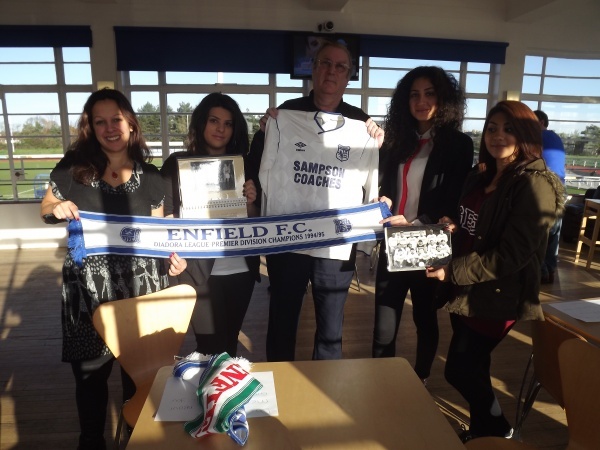 Please visit the Enfield Football Tales website to see the history, interviews and resources generated by this project. You can also contact us via the website for more information, or o contribute.